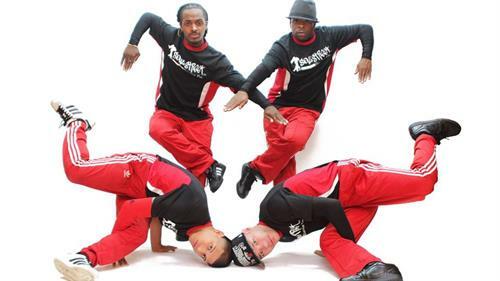 Houston based Soul Street Dance is one of the most dynamic premier dance companies in existence. Their technical and artistic skills, stage presence and wit allow them to push the performance envelope to an amazing standard of excellence. Although they are called a “Dance Company”, their talents far outstrip any one category. In addition to dance, Soul Street performers are actors, athletes, (with uncanny strength), and lately, songwriters and musicians. Soul Street’s high standard and attention to detail coupled with impeccable business practices earned them the honor of representing The United States Of America abroad under the auspices of the Arts Envoys touring program from the State Department’s Bureau of Educational and Cultural Affairs. They have recently completed two tours of the European Eastern Bloc, sharing the joy of dance through workshops and performances with young aspiring dancers from the former Soviet Union countries. They are currently in preparation to represent the U.S. further in an upcoming tour of Haiti. In all travels they garner goodwill for our country and Houston, Texas by modeling sober, responsible behavior along with open hearts and minds and clean fun that allow them to seamlessly share experience with all cultures. Soul Street has the amazing ability to totally engage audiences from ages two to two hundred. A huge repertoire and outstanding flexibility have earned them the title, “Rock Stars of the Educational Theatre World” and they’re working hard to expand these accolades worldwide! Soul Street’s consistent excellence in dance and factual attention to subject matter has made them one of the top educational outreach groups in this country. With repertoire ranging from the music of Vivaldi and, to Rock n Roll to Hip-Hop and every stop in between, Soul Street brings the arts to your facility, huge or intimate, and straight into your heart. They would love to demonstrate this to your audiences in person. Co-Sponsored by the Des & Carrie Bennion Family/the Bon Agency and TownSquare Media. Partial funding is from the Wyoming Arts Council, WESTAF (Western States Arts Federation), and the National Endowment for the Arts, the Schneider and Cate Funds in the Wyoming Community Foundation-Casper, and Natrona School District No. 1.